When it comes to products of the hive, honey is the first thing that comes to mind. It’s true, I get lots and lots of requests for honey. But for me, it’s the wax. Wax for lip balms, face creams, hand lotions, soaps, furniture polish…so many things can be made with beeswax. 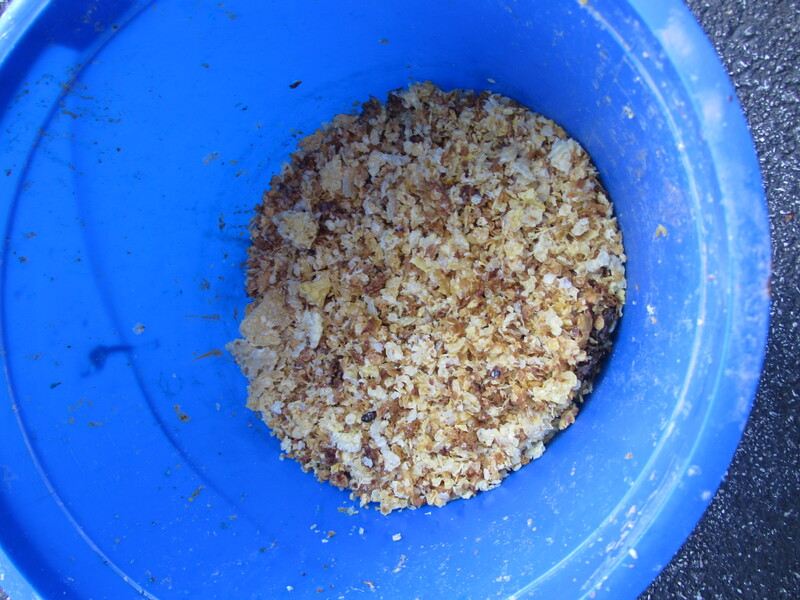 So after extracting a good 30 lbs of sugar syrup, I’d harvested lots of wax cappings – the beautiful creamy yellow wax that covers and protects the honey filled comb. Wax capping is the purest, best quality wax. Particularly good for face creams and skin sensitive products since it moisturizes and protects dry skin. 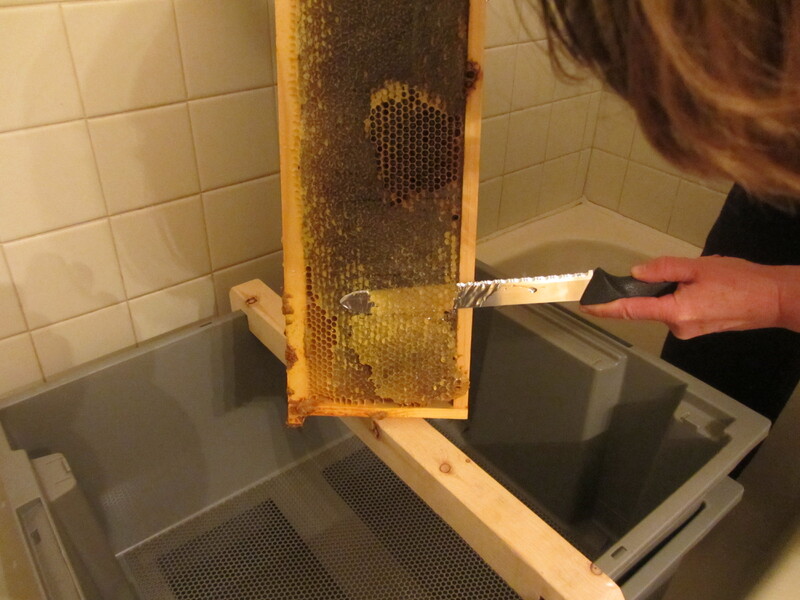 Wax cappings are shaved from the surface to release honey from the comb. Wax can be harvested several ways. The indoor method requires melting the wax down in a pot of water, then straining. This can be a messy process. The other option is to let the sun do all the work for you. Using a basic, inexpensive setup, I built my own solar wax melter, and it works like a charm. 1 styrofoam or insulated cooler with flat edge. 1. Wash your beeswax ahead of time by soaking (for several hours) and rinsing it thoroughly (several times) in lukewarm water. The water should be slightly warm to help melt the honey and grime from the wax, but not warm enough to soften or melt the wax. This process may require several rounds of soaking, rinsing and draining. 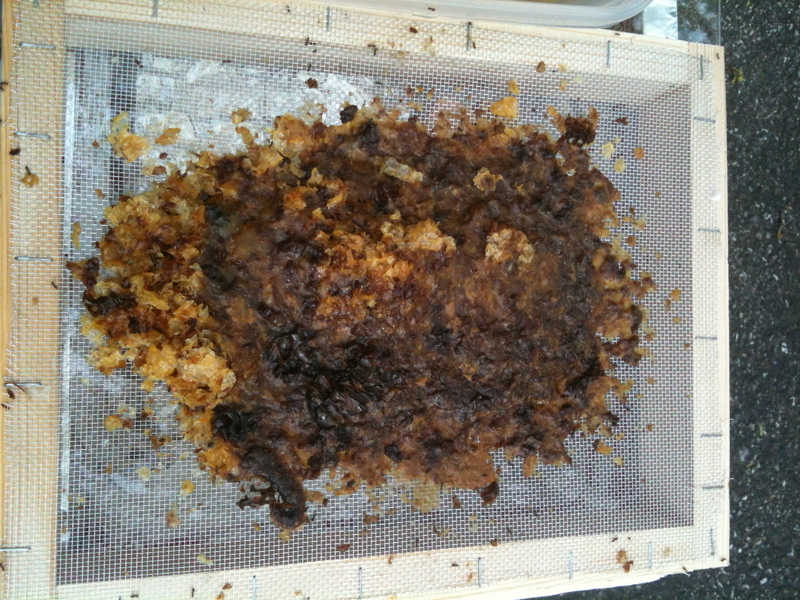 Cleaned wax cappings ready to melt. 2. Gather supplies and prepare to assemble the wax melter. 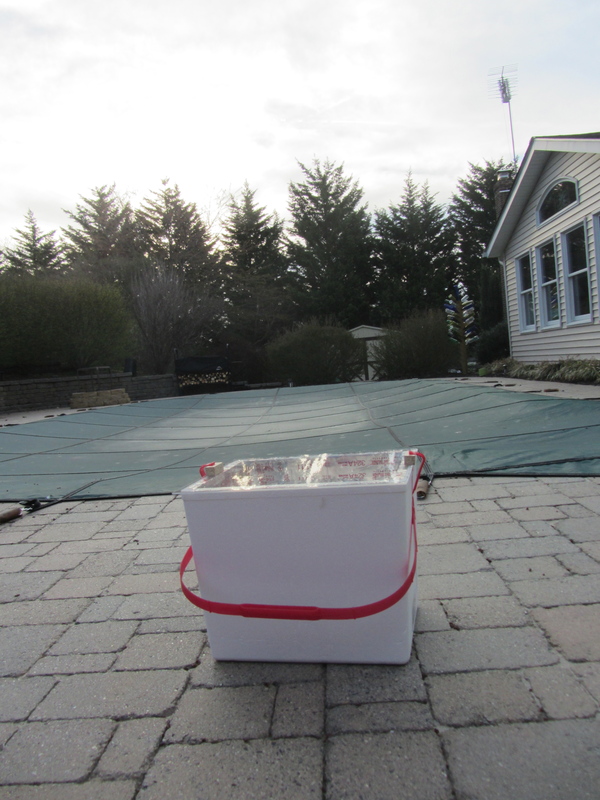 We built a wooden frame sized to fit inside the cooler (above the container), then stapled window screen on the top. This is our filter. 3. 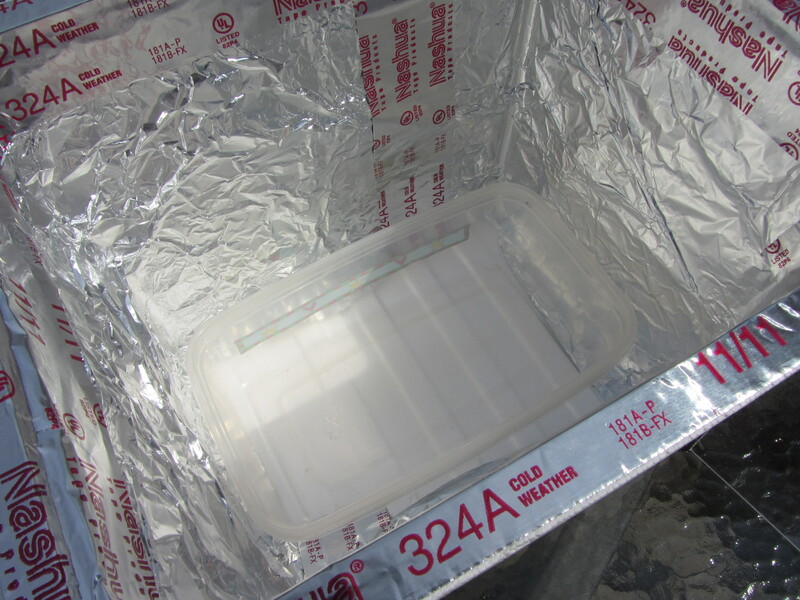 Line the inside of your cooler with aluminum foil (see below). 4. 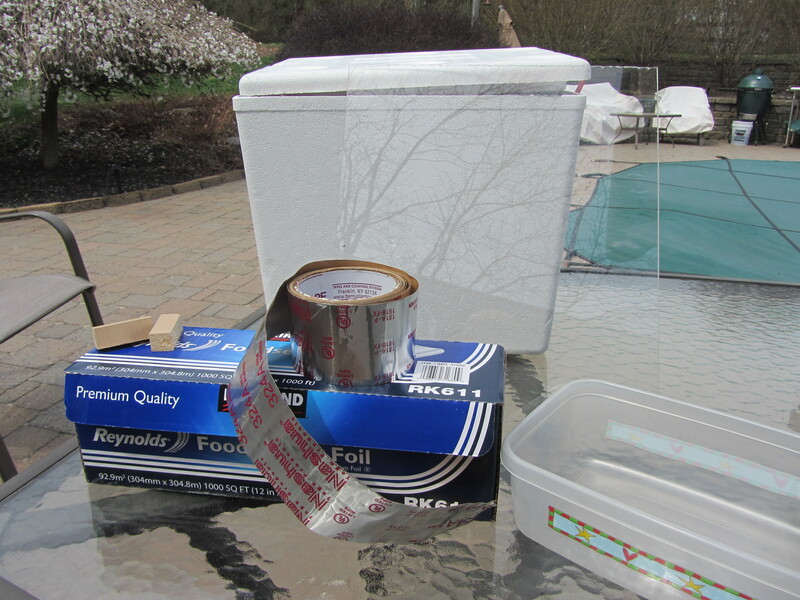 Use the aluminum tape to bind the seams of the foil and adhere the foil to the inside of the cooler (see below). 5. Place the container on the bottom of the cooler (see below). 6. Fill the container 1/3 to 1/2 way with water. The water prevents the wax from sticking to the container. 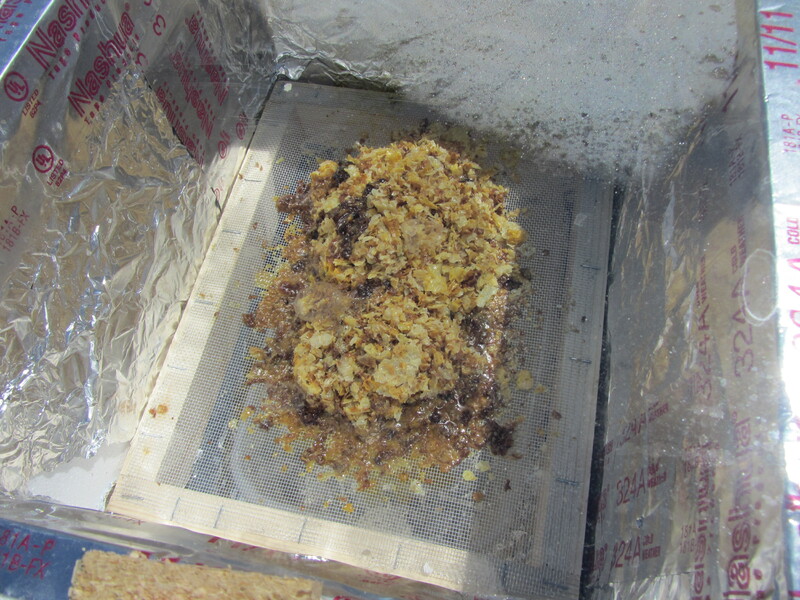 Cooler is lined with aluminum foil, taped with aluminum tape, and a partially filled container of water is place at the bottom of the cooler. 7. 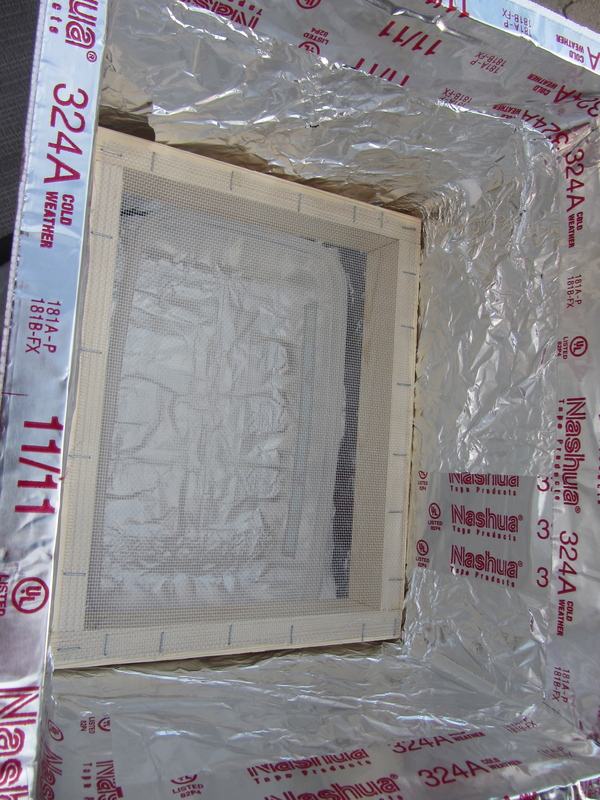 Place the framed window screen over top of the container of water. It doesn’t have to set directly on top of the container, and in fact, is better if it sets about 3-4 inches above the water. Framed screen sets above the container to filter the wax. 8. Place a pile of wax, several hands full, across the top of the screen. The wax is piled across the screen ready to melt down into the water. 9. Place the clear lid on top of the cooler and fit it snuggly into place so it stays on and so the heat remains inside. Then set the cooler out in the sun. The warmer the temperatures, the faster it will melt. Some people place a thermometer inside the cooler to track the temperature throughout the day. Clear lid is in place, secured by two small pieces of wood on each side that are held in place by the plastic lid clamps that came with the cooler. Waiting for the morning sun to come up. Let the melting begin! Depending on the amount of wax and the temperatures outside, melting the wax can take anywhere from several hours to several days. As long as you’re not in a hurry, this method is maintenance free. As it melts, keep adding more hands full of wax into the melter and allow it to accumulate into one piece. Note: Ants do like the smell of beeswax and honey, so bee careful where you set the cooler or your solar wax melter may become an ant farm. This can be prevented by setting the cooler into a container that’s surrounded by water or cooking oil, creating a moat. The ants will drown trying to get to the melter. 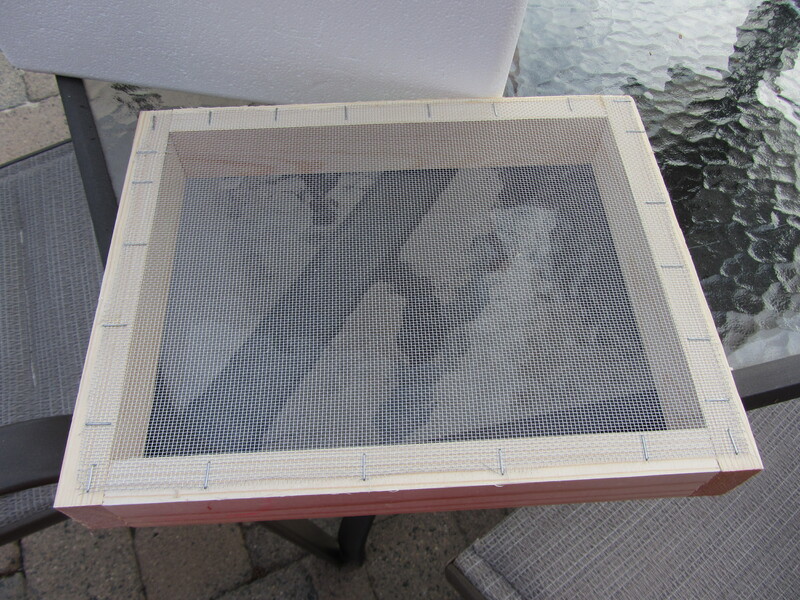 The image below shows how well the window screen filters out the dirt and grime. Left over crud that’s been filtered out of the beeswax. 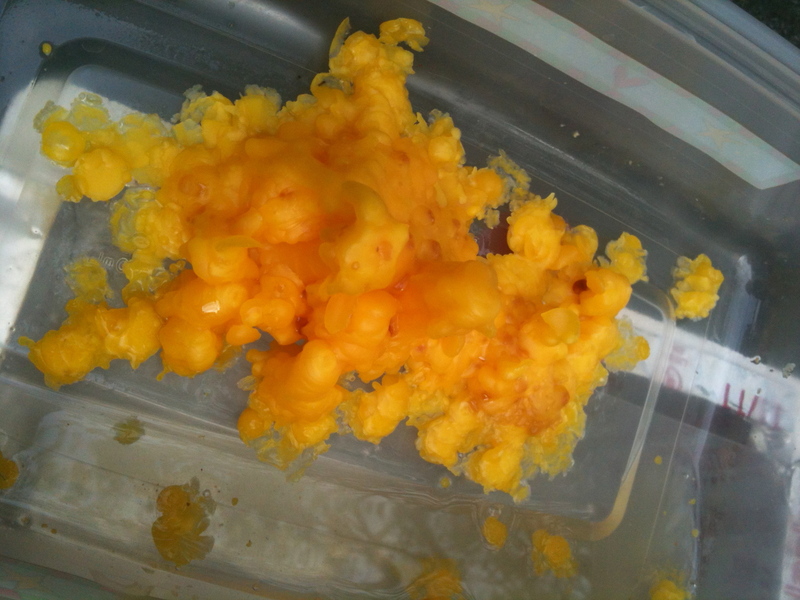 What you’ll have left is a blob-like mound of beautiful, clean, creamy yellow beeswax. This can be used to make candles, lotions, balms, and other fun stuff! Check out my bee recipes and body and wellness recipes, located at the top of this site to view some of my own favorite beeswax recipes, like Beeswax Lotion Bars or my Homemade Face Cream. Voila! Clean, filtered beeswax, ready to bee turned into something fabulous! I see another project in our future! Thanks for sharing. Excellent! Ants don’t hurt anything, but they are annoying. I highly recommend setting the container in some shallow water or on a layer of oil. Otherwise, works great. Happy melting! 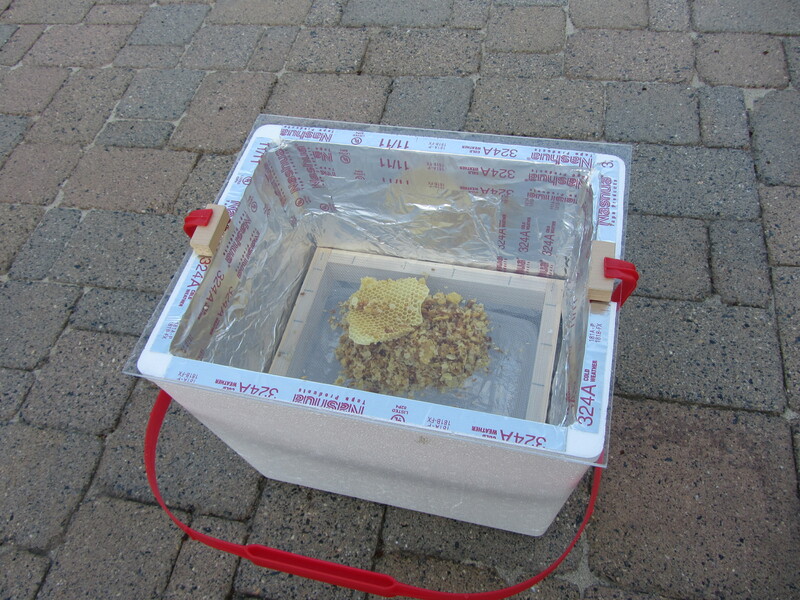 This is a great way to build a simple solar wax melter. We’ll have to try it, too. Simple, inexpensive, low maintenance and it works!